The 2008 Democratic presidential candidates fielded a range of questions on how they would tackle global warming and increase America's energy independence in two recent, innovative, 'people-powered' debates. 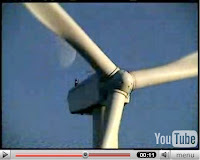 Both events - MoveOn.org's 'Virtual Town Hall' on Climate Change and the CNN-YouTube Debates - posed questions to the candidates that were submitted by individuals via video and the internet. Earlier this month, the full range of candidates fielded three questions each on how they would tackle the climate crisis in MoveOn'org's Virtual Town Hall on Climate. The event was organized in conjunction with the LiveEarth global concert series, held on July 7th. You can watch the candidates' responses to each question online here. Last night, CNN and YouTube organized a similar event that used internet-submitted videos to pose questions from average Americans to the Democratic candidates. This format was both innovative, and in my opinion, effective. The questions were harder hitting, more pointed and even in many cases entertaining than the previous television debates. The candidates fielded three questions on energy and climate change, although not all candidates responded to the questions. You can see the three energy and climate focused questions from the debate below. The debate was broadcast live on CNN on July 23rd and you can head to the CNN-YouTube Debates website for videos of the full debate. 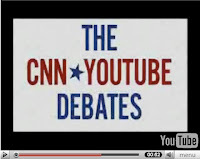 CNN and YouTube plan another 'people-powered' debate with the Republican presidential candidates soon. 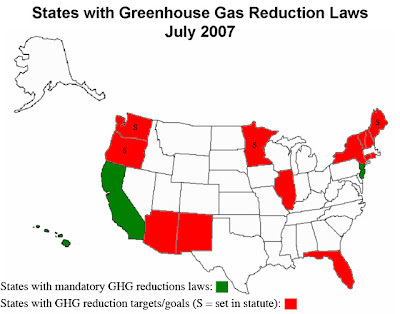 Question: "How will your policies reduce energy consumption in the United States?" Question: "What is your stance on nuclear power?" Additionally, the tax bill expands the Residential Energy Tax Credit, available to homeowners who invest in renewable energy systems, efficient appliances, weatherization and other home efficiency retrofits. Homeowners can now claim the credit on more than one investment in a given year, allowing them to claim a credit on both a solar electric system and a solar water heating system installed in the same year, for example. The bill also raises the maximum credit for fuel cells and small wind power systems to $6,000 (up from $1,500), the same maximum credit available for solar photovoltaic systems. Finally, an uncontroversial tax credit bill, SB 875, added ocean wave energy to the list of BETC-qualifying renewable energy resources. 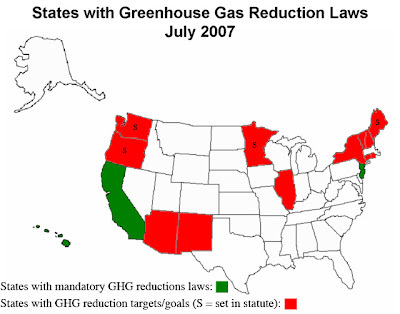 Eleven other states have set greenhouse gas reduction targets and four of them - Maine, Minnesota, Washington and Oregon (see this post) - passed legislation this year setting those reduction targets in state statute, according to this CDM Knowledge Center update on state greenhouse gas laws and actions. 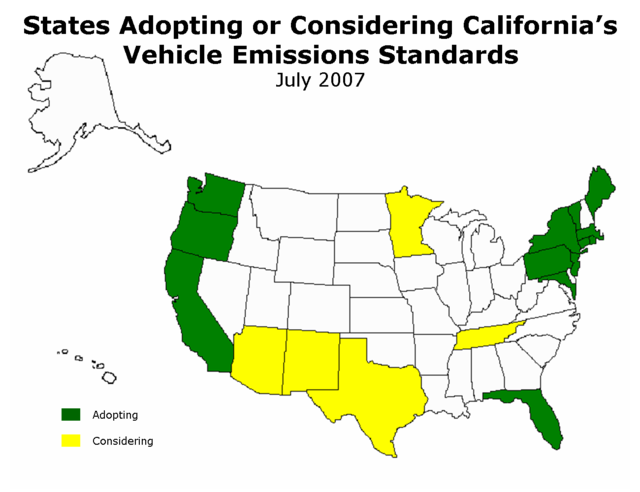 The other state targets were issued by governor's executive order. The following video was produced by Greenpeace and released in conjunction with the release of the Intergovernmental Panel on Climate Change's Fourth Assessment Report in February (see previous posts here and here). That report found that the occurrence of global warming is "unequivocal" and concluded with greater than 90% certainty that human activity is to blame for rising temperatures. Watch this video (click on the image below to follow the link) and listen to the voice of today's youth and of those generations yet to come. 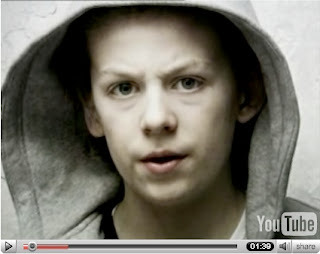 While this child's apparent anger is justified in my opinion, it may not make for the most effective call to arms. Still, listen to his words, recognize the intensity with which they are spoken, and realize the truth in his message: climate change doesn't just put "the future" at risk - it puts our future at risk, the future that today's young people will inherit, live our lives in, raise our children in. For today's youth - and for those yet unborn, if only they could speak - the climate crisis is real, it is urgent, and it is of the highest priority: our very future hangs in the balance. And yet we cannot solve it without the assistance of today's adults - those who hold positions of power, wealth and responsibility. Unless we begin today to make the necessary investments and set the public policies that change course towards a sustainable future, today's youth will be left without the tools we'll need to rise to our greatest challenge: de-carbonizing the planet and building a sustainable energy future. We're your children and grandchildren, your neighbors, friends, and as some of us enter the workforce, your co-workers. Will you help us? Or will you condemn us to clean up your mess in a darker future? We are ready to rise to the challenge - but we can't do it alone! This is certainly an interesting development: coal companies are starting to push back against major corporations, including GE, General Motors, Caterpillar and Alcoa, who have come out in support of regulations on greenhouse gas emissions. One coal company exec has even gone so far as to call these companies "un-American" and is refusing to do any more business with one member of the United States Climate Action Partnership, an organization of 23 major corporations and six national environmental groups calling for nationwide carbon regulations. U.S. coal mining companies, which for years have been branded the bad guys of global warming, are fighting back. They are questioning not only the science but also the motives of some of the big-name corporations who have made well-publicized commitments to cleaning up their act. At a recent industry conference in New York, Arch Coal , one of America's "Big Four" producers, stressed the need for research and investment in "clean coal" technology that would allow the country to utilize its abundant reserves while weaning itself off foreign oil. "If we want to address climate concerns, we need to invest more heavily in coal -- not less," Chief Executive Steven Leer told the McCloskey Coal USA conference. 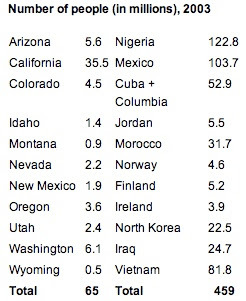 "We cannot reduce foreign oil dependence without increased coal use," he said. "Debate can help advance clean-coal technology investment." A more outspoken executive, Robert Murray, chairman and chief executive of Murray Energy Corp., warned the coal industry could collapse with the loss of 3 million to 4 million jobs if carbon dioxide emission controls are introduced. He has even put his money where his mouth is by refusing to do business with Caterpillar Inc. -- a manufacturer of the very mining equipment his company needs. "There are a number of companies that are promoting constraints on coal use to achieve greater profits and/or competitive advantages," Murray said at the coal conference. He branded more than 20 major corporations that make up the U.S. 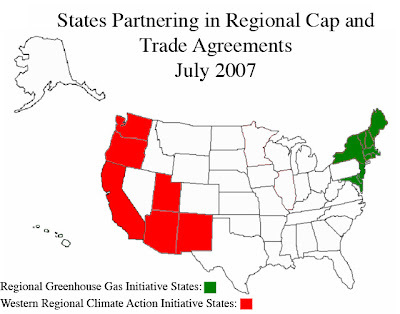 Climate Action Partnership (USCAP) "un-American" for allying with environmental groups he calls "enemies of coal." USCAP, which backs moves to cap carbon dioxide emissions, includes Caterpillar, General Electric Co. , Dupont Co , AIG , General Motors Dow Chemical Co , Johnson & Johnson , Pepsico Inc. , Alcoa Inc. and ConocoPhillips. "I've been trying to get their attention," Murray said. "(CEO) Jeffrey Immelt of GE and I debated this for about 45 minutes, but I didn't convince him of anything because he sells windmills ... he wants to see the global warming come along." There was no immediate comment from GE. Caterpillar said that while it would not debate the science, it believes it is incumbent on industry to reduce emissions. "Knowing this debate is going to get under way in earnest we're here to protect the interests of our customers, particularly coal," the truck and tractor maker said in a statement. "We can be more effective protecting those interests by supporting a single national mandate ..."
Congress is considering several bills that aim to fight global warming by putting tough limits on greenhouse gases. Supporters say the bills would provide incentives for companies to invest in technology to cut emissions. Murray, whose private company produces about 30 million tons of coal per year, has formed the Coal-based Stakeholders Chief Executive Officers Group, comprising CEOs of railroads, some coal companies and utilities. It opposes so-called "cap and trade" regulations, arguing that caps on emissions will devastate the U.S. coal industry which fuels about 50 percent of the country's electricity generation. Murray said he sent Caterpillar CEO Jim Owens a letter a few months ago telling him he would no longer do business with him - a decision he said will result in the loss of millions of dollars in business to Caterpillar. He also pointed out power company Exelon Corp's John Rowe, as "one of the biggest enemies of coal for decades because he's got nuclear." Chicago-based Exelon, which is not a member of USCAP, said in a statement that Rowe is "a leading proponent of moderate and thoughtful climate change legislation that preserves all technological alternatives." He co-chairs the National Commission on Energy Policy, which has advocated for a variety of technologies to address climate change, including clean coal and carbon sequestration. "And certainly John is an advocate for nuclear power." USCAP includes six environmental groups, including the Natural Resources Defense Council, whose climate expert, David Hawkins said that getting big-name companies to join was crucial to achieving its aims. "They put the issue on the radar screens of many more members of Congress who no longer see it as an issue that environmental groups are exaggerating. "These companies validate the seriousness of the issue," he told Reuters. Hawkins said there was "a serious shot of legislation being enacted in this Congress and signed by this president."